Indiana State University and the Indiana State University Alumni Association will host a special sesquicentennial Founders Day celebration at 1:30 p.m. Wednesday, Jan. 27 in the Heritage Ballroom of Tirey Hall. This year's event is a tribute to the university's second oldest college, the College of Arts and Sciences. Dean John Murray will speak and take part in the traditional Book and Torch Ceremony and the new ceremonial Cornerstone Creed. Cake will be served in celebration of State's 150th birthday, and the first 150 guests will receive a commemorative sesquicentennial gift. To attend, RSVP call 812-514-8400 by Monday, Jan. 25. Founded in 1865, the Indiana State Normal School opened its doors to 23 future educators in 1870 and now serves more than 13,500 students as a comprehensive university with a 100-plus programs of study. Last year, the Bayh College of Education hosted the celebration as the oldest college at the university. Next year, the Scott College of Business will lead the Founders Day festivities, followed by the College of Technology in 2018 and the College of Health and Human Services in 2019. 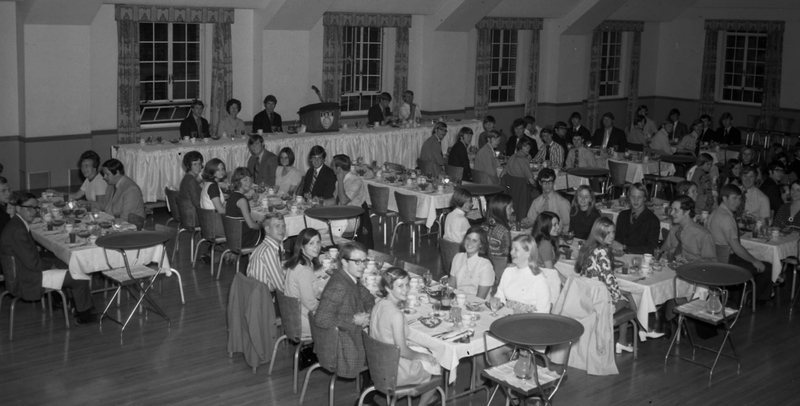 Photo: http://photos.indstate.edu/Other/ISUphotoservices/Photography-Services-Miscellan/Founders-Day-selects/i-s9JctZn/0/X3/1971-X3.jpg -- Members of the Alpha Tau Omega host a banquet on Founders Day in the Tirey Memorial Student Union (now Tirey Hall).